Bosch is preparing for mass production of its plastic housed 48-volt Lithium Ion battery for use in hybrid vehicles. Bosch’s new 48-volt battery for hybrids is in demand by automotive manufacturers across the globe. 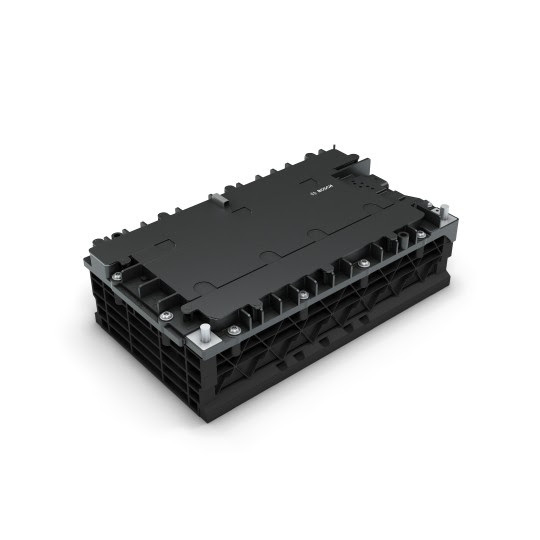 Similar to the Bosch e-axle, this innovative 48-volt battery is standardised for easy integration into new vehicle models. Established manufacturers and start-ups alike can thus eliminate long and expensive development processes. “Bosch is an incubator of electromobility. We help manufacturers reduce their development times and launch their products faster,” says Dr Rolf Bulander, chairman of the Bosch Mobility Solutions business sector and member of the board of management of Robert Bosch. This means that installation of the lithium-ion battery will benefit not only compact cars, but mini- and microcars as well. Production of the battery is scheduled to start in late 2018. Anticipating a large market for entry-level hybrids, Bosch offers other powertrain components for these models in addition to the 48-volt battery. The company estimates that some 15 million 48-volt hybrid vehicles will be on the road by 2025. Automotive manufacturers everywhere – whether in China, Europe, or North America – are all striving to cut CO2 emissions, which in practice means reducing cars’ fuel consumption. Bosch has systematically designed its new 48-volt battery to do precisely that. For instance, the lithium-ion cells Bosch uses are as compact as possible while still achieving a reduction in CO2. The 48-volt battery is in high demand, particularly among Chinese manufacturers, and the lithium-ion unit is poised to become a global success. Bosch is already in talks with over a dozen customers and has secured a considerable number of production projects. The secret of the battery’s success is its sophisticated concept, which offers a comparatively inexpensive way to help reduce vehicle CO2 emissions. This is also due to the product design, as the battery requires no active cooling and its housing is made of plastic, not metal. Both these factors bring costs down still further. The plastic housing presents a real challenge, as lithium-ion cells expand when the battery is charging and over the course of the unit’s service life. As a result, the housing must withstand a certain amount of stress. Bosch engineers rearranged the cells in the 48-volt battery so that even plastic housings can bear the pressure.